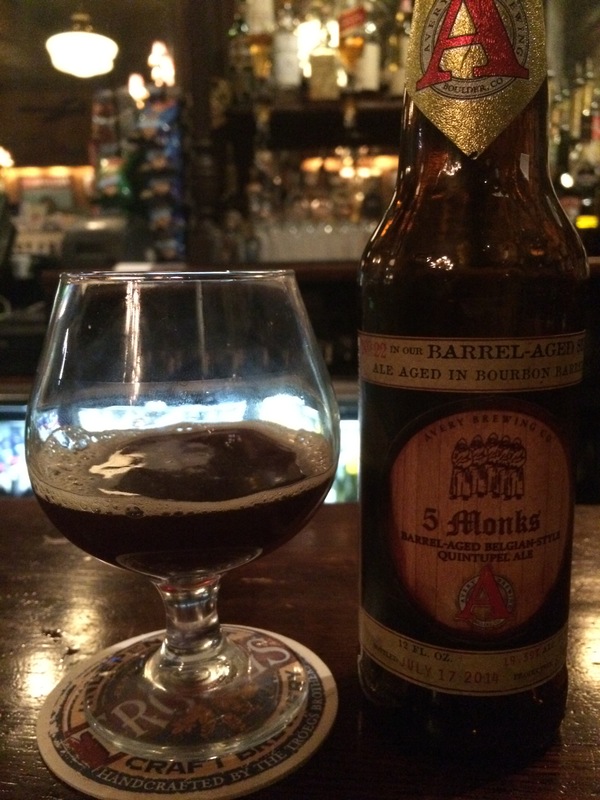 Quick Take: 5 Monks, while on the sweeter side, stops just short of cloying to be a sipping warmer with some malt depth that’s made just a touch deeper by the bourbon-aging. Avery is world class when it comes to big beers, so the fact that 5 Monks kills it shouldn’t come as a surprise. Awesome beer and one the dark malted Belgian and bourbon lovers should hunt down immediately. Brew Facts: 5 Monks, the 22nd release in Avery’s Barrel-Aged Series, has the distinction of being Avery’s highest gravity beer ever. That’s quite an honor considering that Avery brews over 30 beers that have an ABV in the double digits, 10 of which are over 15%. Avery refers to 5 Monks as a quintuple, but insist it’s just a joke as sextuple sounds too dirty. Appearance: This is a calm pour, barely waking up enough to foam up a head. Some frothy skateboard-worthy ramps of beige bubbles pile on each other and cling to the glass edges. While the head was minimal, the retention is tenacious. A cursory glance at the glass and this looks a bit darker than most Quads. Held to the light, the color is revealed to be light brown with a crimson luster. Aroma: A sniff finds buttery bourbon, plum/raisin, and dark malt sweetness. Candied sugar, toffee, and some vanilla round out this delectable aroma. It hits the typical dark fruit notes you’d expect from a Quad and mixes in the caramel/toffee malts of a Barleywine. A successful blend that has me intrigued if not a bit hesitant that cloying levels of syrupy sweetness are in my future. Taste/Mouth Feel: Going glass to mouth finds a near syrupy thick mouth feel and little to no carb. This leads to the kind of heavy body you want out of a beer this big. The taste buds take over and find caramel malts and candied sugars in what should be over the top sweet, but the oak barreling blends this into a pleasing warm kiss of raisin sweet alcohol and vanilla. Some dark fruit tang surfaces in the sugared toffee malt to remind you that this is Quad, but it hits like a Barleywine. The late flavors of char and buttery popcorn emerge on the finish. Just a fantastic, spicy warm capper that heats your core like uranium. Don’t breathe out near a flame or you’ll catch fire. This is really where Avery excels; malted booze bombs that are as smooth as they are sticky. Final Thoughts: 5 Monks is an intensely malted, boozy bomb of a beer that avoids the cough syrup and cloying qualities that can sink these big ABV bruisers. While on the sweeter side, it stops just short of cloying to be a sipping warmer with some malt depth that’s made just a touch deeper by the bourbon-aging. The candied sugar element keeps this in the realm of a Quad as does the deeper plum qualities, but you may need an appreciation of Barleywines to hang with these monks. Of all the Avery’s Barrel-Aged Series I’ve had, and I’ve had many, this and Uncle Jacobs are the pinnacle for me. Avery is world class when it comes to big beers, so the fact that 5 Monks kills it shouldn’t come as a surprise. Awesome beer and one the dark malted Belgian and bourbon lovers should hunt down immediately. Note: I went out and bought two more bottles at $15 per if that gives you an idea of how I feel about this one.